After your user account has been created and you have set your password, you can log in to Dentrix Ascend. To log in for the first time, you will need information contained in the automated email message that was sent to you when your user account was created. 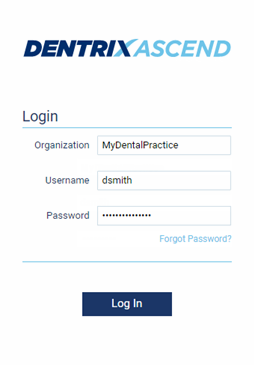 On the Login page for Dentrix Ascend website, type your customer ID or organization name, user name, and password. Organization - Your organization's customer ID or name (which is the sub-domain name entered for your website profile). This is not case-sensitive. A customer ID is a unique identifier for each organization that uses Dentrix Ascend. Henry Schein One creates an account, and assigns your organization a customer ID upon signing up your organization to use Dentrix Ascend. Spaces are not allowed in the Organization field. If you type spaces, Dentrix Ascend will remove them automatically. Username - The user name that was either created by you if you are an administrator or assigned to you by an administrator. User names are not case-sensitive. Password - The password for the user name entered. Passwords are case-sensitive. Tip: If you have forgotten your password, click the Forgot Password? link to reset your password. Click (or tap) Log In. Note: If you enter your password incorrectly five times, your user account will be locked for 30 minutes, during which time you will not be able to log in. However, if your account is locked, you can click the Forgot Password? link and reset your password to unlock your account immediately and log in. The locking and unlocking of your user account will appear in the audit log. Additionally, if after the initial five failed login attempts you enter your password incorrectly 10 more times, your user account will be locked again, and you will be sent an email message that contains a link that you can click to reset your password. Can I log into multiple organizations from one computer? Why do I get the error message "Your connection is not private"? How can a user be logged on to 2 computers at the same time? How Can I update the credit card information I have on file for Ascend?